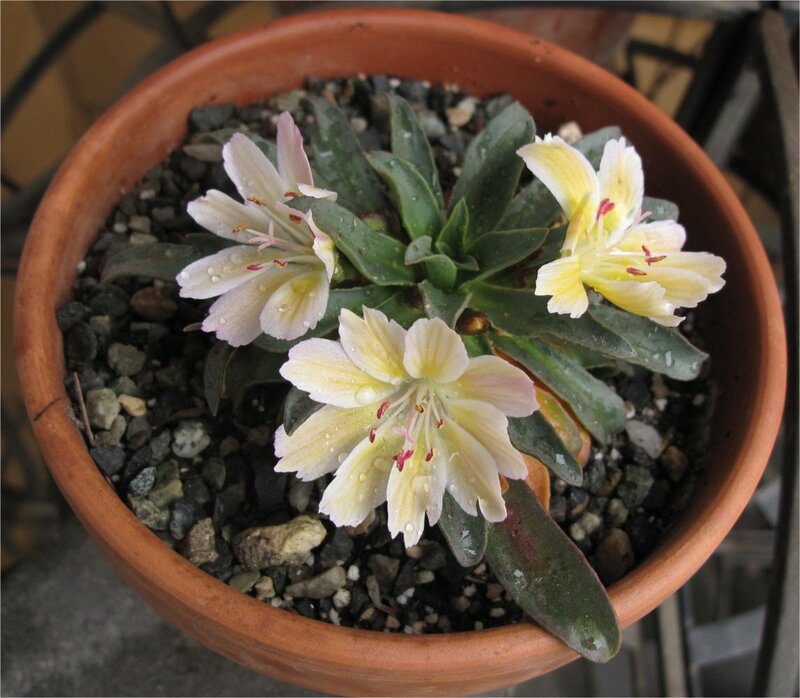 The Genus Lewisia, endemic to Western North America and numbering about 20 species belongs to the small family Portulacaceae, which is characterized by, among other characteristics, fleshy leaves. Most of the 20 Lewisia species, especially the evergreens, have leaves that are downright succulent looking. But it is the flowers that have captivated generations of alpine and rock garden enthusiasts since Meriwether Lewis, in July of 1806, first saw the plant in flower at about 3,400 feet near his campsite on the Bitterroot River near the village of Lolo in Missoula County, Montana. For me pot culture, clay preferably, affords many advantages, especially the ability to have the blooms displayed at eye level. Certainly many folks incorporate L. cotyledon hybrids into the landscape in rock gardens and other beds with excellent drainage. But for me, the simplicity of moving a clay pot into view, and also having the ability in our northwest wet winters to move the Lewisia pots to a drier covered area, heavily favors pot culture. 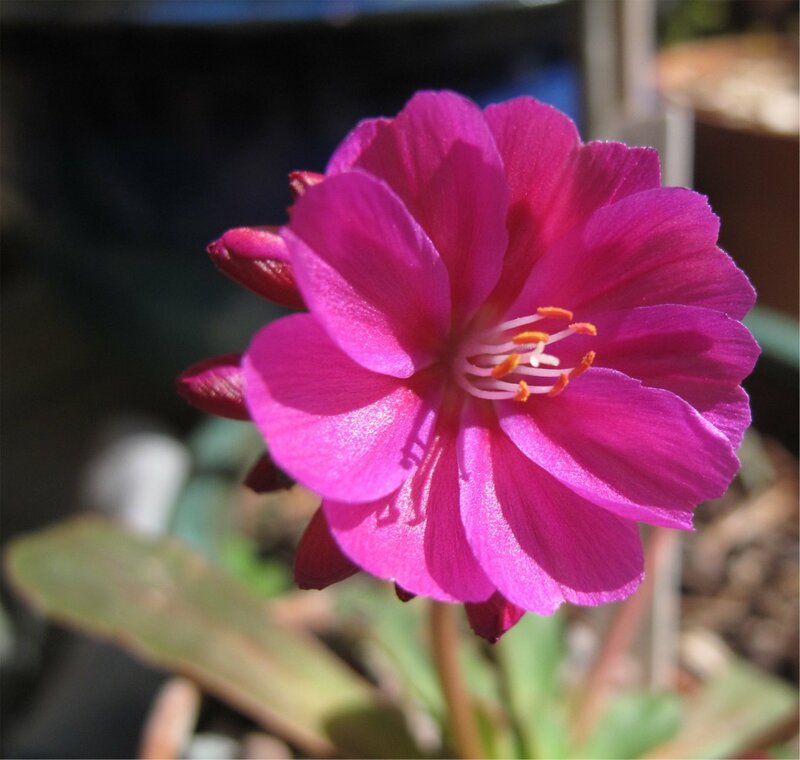 Lewisia cotyledon is considered by most gardeners the easiest to cultivate and is the species growers have hybridized the most, making its cultivars and hybrids the most visible in general nurseries and occasionally available for purchase at the big retail garden centers. Nonetheless, even this plant disappoints many novice gardeners when grown in the landscape. While tough as nails with respect to temperatures, cotyledon and cotyledon hybrids prefer some protection from winter wet. 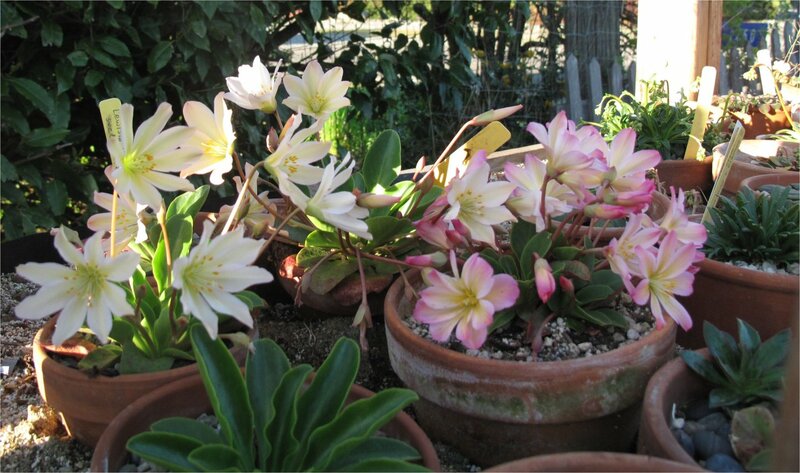 British alpine enthusiasts have been growing and hybridizing Lewisias for decades. Crosses between L. cotyledon and L. rediviva from Ashwood Nurseries have produced some stunning yellow shades. Rediviva may just be the most stunning species in the wild, with bloom that rivals any Lewisia. It’s distributed widely throughout the West, is very drought tolerant, since it dies back (estivates) in summer, presumably in response to dry conditions. In cultivation during its active growing period in early spring rediviva tolerates saturated soils, though I recommend clay pots with excellent drainage or plunging pots into a sand bed. Watering the sand bed sparingly, especially during dormancy, is helpful in keeping rediviva happy. 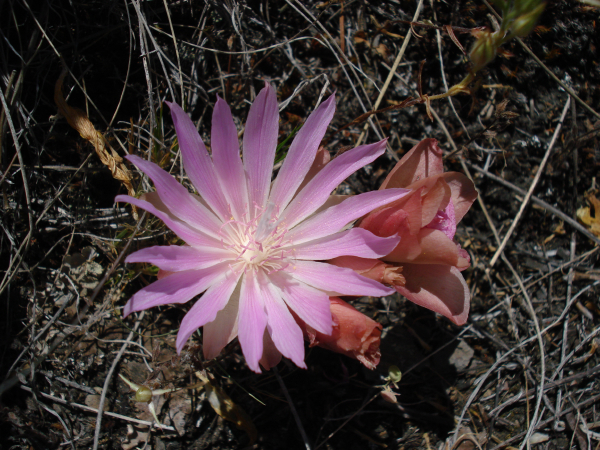 This entry was posted in Alpines, Pacific Northwest Natives, Plant Picks and tagged Ashwood Lewisias, Bitteroot, Lewisia cotyledon, Lewisia cultivation, Lewisia genus, Lewisia rediviva, Lewisia species by Bart Arenson. Bookmark the permalink. Interesting post. Living in the Midwest, I am not familiar with this plant. I assume it stays perennial when grown in pots? Do you mix it with annuals to maintain seasonal interest? 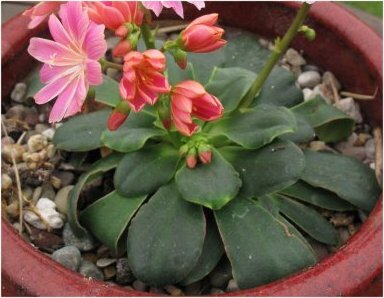 Actually I don’t see it as a garden plant, except maybe for my tiny rock garden, so when the Lewisias bloom in the spring I scatter them around the garden and hardscape in pots. So in a way I treat them like annuals, relying on them for their color and bloom, which is mostly spring and early summer.